My favorite part are the feet sticking out! 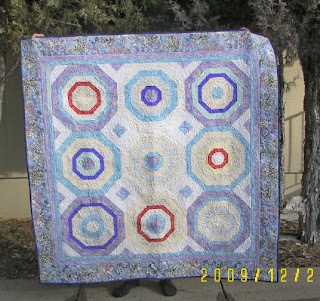 This quilt pattern is again, a Kaleidoscope quilt. I made 2 strip sets of the same strata, pressed one up, the other down, and sewed them together, being careful matching seams. This arrangement purposely does NOT have the kaleidoscope effect I usually aim for. I purposefully made a variety of "rings", just for a child's interest. Meggie asked for "Fairies". This Fairy fabric came from Keepsake Quilting - it is an amazing piece of fabric, excellent quality, and more than I ever pay for fabric, but worth it now. The orange is supposed to be kinda melon, and I was thinking this quilt was toooo soft and wimpy (wimpy is NOT my style). And, the orangey melon has little stars that actually glow in the dark - I tried it out. THAT feature was too good to pass up. Yes, it kinda jumps out at you but I like it. Fairy Rings are circles of growth, grass, or mushrooms that are found in more humid climates, often in yards. I was told that fairies had been on the lawn during the night, and had been playing, and the mushrooms were their little chairs, or maybe umbrellas. The "fairy rings" evolve from some kind of spore growth pattern. Meggie lives in Wisconsin where there is plenty moisture, so I'm sure she's seen these 'rings' in her yard. Below - I like it laying in the snow. I'm never going to challenge Diane Gaudynski but I'm good enough! Close up of quilting - this swoopy, leaf/heart pattern in the double inner border is/was the first pattern I learned to machine quilt on my DSM. If you outline it a second time, it has more 'heft.' The swoopy, twirling viney lines are great fillers, and you can bet a child will glom onto that pattern and follow it with her fingers, as she slips off into a nap. It goes in the mail! Great finish! I'm sure she'll love it. I like the bright rings in there. The quilt turned out so nice - you have to make sure she knows what fairy rings look like in the lawn and the stories about the fairies having their parties at night. She can dream about the parties the fairies are having on her quilt! It's such a lovely quilt! So soft and feminine, but lots of interest and movement. That is so pretty! That reminds me of some pictures I took of some fairy rings here last summer. I will email you some photos. wonderful-how happy she must be!! It's beautiful! And that Fairy fabric is wonderful. I love the glow-in-the-dark stars concept - that's perfect for fairy rings! And your quilting is beautiful. I'm sure Meggie will love this special quilt! Your quilts are always pleasing, Elaine. Perfect! Great that you kept the glow in the dark fabric. Every kid loves that. Well, me too. Beautiful! I'm sure it will be loved! Well done! She is just going to love it. Congrats on a delightful finish! She's going to love it. I loved reading your post and this really made me smile because it's so true... "and you can bet a child will glom onto that pattern and follow it with her fingers, as she slips off into a nap." Well made and well said wonderful Quilter, dear Elaine! 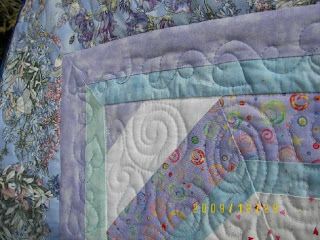 What a pretty quilt and I love the swirls in the middle and the vine in the border. It's going to be loved! Mahhhvelous. Really love the back. I know she will love it!! The quilting is great...I would like to know how you keep it from bunching up under the needle like mine does. Happy New Year!! It is beautiful Elaine, & this Meggie rather wishes it was hers! Elaine, this is such a beauty! You did a great job of putting together the theme, colors, pattern, quilting motifs, and I know the child who gets this will love it forever! Great job Elaine! I am sure Meggie loved it! I love the idea of her name appliqued on the back. Got to remember that one for any future kid quilts I do. 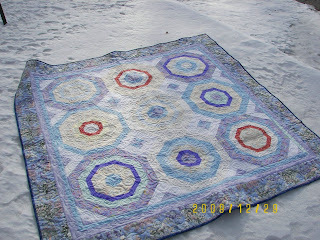 Great quilt, and I love that you photographed it in the snow. Just beautiful! What great sounding fabric and the quilting is perfect for the fairys!